The Slovenian electronic communications sector has lost much of its steam between 2008 and 2011. The sector's investment, driven by infrastructure competition and fibre deployment, peaked in 2008 at EUR 401 million, accounting to 32,6% of the sector's revenue (Figure 1). The investment then fell to EUR 120 million in 2011, representing only 9,8% of the sector's revenue, which placed Slovenia in the last position among the EU Member States (Figure 2). Investment in the electronic communications sector recovered to EUR 173 million in 2012, reaching a level of 14,3% of the sector's revenue. Figure 1: Investment in networks by the electronic communications sector in Slovenia, 2008-2012. Source: Statistical Office of the Republic of Slovenia (2013, 2012, 2011) . 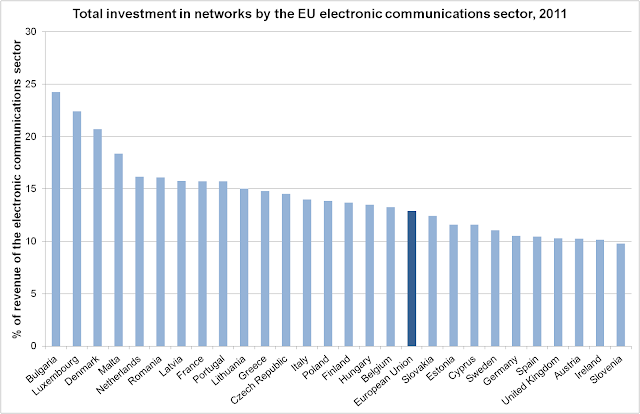 In the period from 2009 to 2011, the total investment in networks by the electronic communications sector in the EU that includes both tangible and intangible investment increased from EUR 39.148 million to EUR 41.807 million, or expressed as a percentage of the sector’s revenue, from 11,7% to 12,9%. In 2011, in seventeen member states the investment was above average, in nine states it exceeded 15%, while in three states it even exceeded 20% of the sector's revenue (Figure 2). Figure 2: Investment in networks by the EU electronic communications sector, 2011. The sharp decline in network investment in Slovenia was not directly related to the financial and economic crisis. The main reasons for such a decline were sharp investment cuts by a highly indebted Telekom Slovenije's leading fibre broadband competitor T-2 and the investment policy of the Telekom Slovenije Group whose investment represented more than half of the total Slovenian electronic communications sector investment. In the second half of the past decade, the TS Group had expanded its operations to the South East European markets. Desperate for expansion in the region, Telekom Slovenije had drastically overpaid its acquisitions in Albania, Bosnia and Herzegovina, Kosovo, and Macedonia. The company had also been overly generous in buying out minority shareholders (STA). Following a disclosure of irregularities, Telekom Slovenije determined the fair value of its investments in South East European subsidiaries in 2010 and recognised impairments of EUR 266 million. Further impairments of these investments were recognised in 2011 (EUR 45,4 million) and in 2012 (EUR 5,9 million). The total value of investments in subsidiaries in South Eastern Europe as of 31 December 2012 was EUR 57,8 million. The moral hazard in acquisitions in South Eastern Europe has been reflected in the TS Group’s domestic operations. The Group has strived to reduce costs, optimise working capital and improve efficiency. As a part of these activities it also significantly reduced investment in the construction of new or upgrading of existing networks and services from EUR 196,2 million in 2008 to EUR 69,2 million in 2011 (Figure 3). However, it should be noted that these figures include investment of the content branch, which represents a substantial part of investment in subsidiaries. Figure 3: Structure of investment in fixed assets of the Telekom Slovenije Group, 2007-2012. Source: Annual reports of the Telekom Slovenije Group. Notes: (1) Subsidiaries in Slovenia include: Avtenta, GVO, TS Media and Soline. (2) Mobitel was merged with Telekom Slovenije, the parent company of the Telekom Slovenije Group, on 1 July 2011. In 2012, the TS Groups increased its investment in Slovenia to EUR 97,6 million. The investment plans for 2013 were in the same range. The investment focus in 2012 was on establishing the TS Group’s own TV station (Planet TV) and upgrading its mobile broadband network to 4G LTE technology in the 1800 MHz frequency band in all major Slovenian cities. As a part of its own TV station project, the TS Group secured the three-year broadcast rights for the UEFA Champions League. It also continued to invest in improving and upgrading its access network by upgrading the copper-based access network, shortening the copper local loop, and deploying fibre-optics. The substantial investment was earmarked for expanding a range of digital advertising, managed and cloud computing services. An analysis of annual and interim reports revealed that the TS Group significantly reduced investment in expansion of its broadband access network. The finances the Group had invested, and mostly lost, in South Eastern Europe would have been sufficient for the investment needed to build rural broadband networks around Slovenia and to achieve the Digital Agenda 2020 targets. Instead, after the fiasco in South Eastern Europe, Telekom Slovenije has sharply cut investment in broadband networks in Slovenia. The sharp decline in network investment in recent years has been reflected in various international comparisons, where Slovenia has lost much of its esteem. According to Speedtest.net, consumer download speeds in Slovenia have been amongst the lowest in the EU. The results have been confirmed with other speed tests. They have been especially warring for Telekom Slovenije as the download throughputs in its network have been well below the Slovenian average. The fiasco in South Eastern Europe has cost the TS Group and its shareholders not only a few hundred million euros, but also a loss of steam in its domestic investment. As understood from the company’s public statements, business plans and reports, Telekom Slovenije is not expected to have increased its network investment before 2014. But even then it would rather rely on public funding, as clearly expressed in its own strategy to achieve the Digital Agenda targets presented in 2012. The costs of building 260 thousand mostly rural broadband connections were estimated at EUR 450 million of which Telekom Slovenije would provide 30% and the rest should be financed by the Government and EU. The TS Group has been extensively lobbying the Government and regulator to follow its strategy in national plans and regulation and secure substantial public subsidies to finance the construction of rural broadband networks. The focus would be on shortening the copper local loop, complemented with fibre and mobile broadband deployment (LTE). According to its strategy, Telekom Slovenije was explicitly not in favour of a large scale deployment of LTE in rural areas.